Fitting a rack Bolt Set to any door means added door security for your customer. Developed as an added security measure, this great product allows you to simply add an additional lock on the inside of the door to keep intruders out. 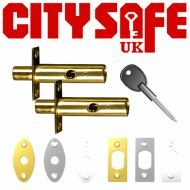 Currently at CitySafe UK we stock the impressive TradeLocks Rack Bolt Set which includes 2 bolts and a fantastic coloured plate depending on the finish of the rest of your customer’s door hardware. Featuring a high quality pair of bolts, which have surpassed the EN12051 standards and have been tested with over 5,000 cycles your customer’s will be ensured their Rack Bolt Set is of the highest quality and durable.